Strong heroine, and scary mech-dinosaurs in a post-post-apocalyptic setting. Ben Carmichael reviews a game that has it all. 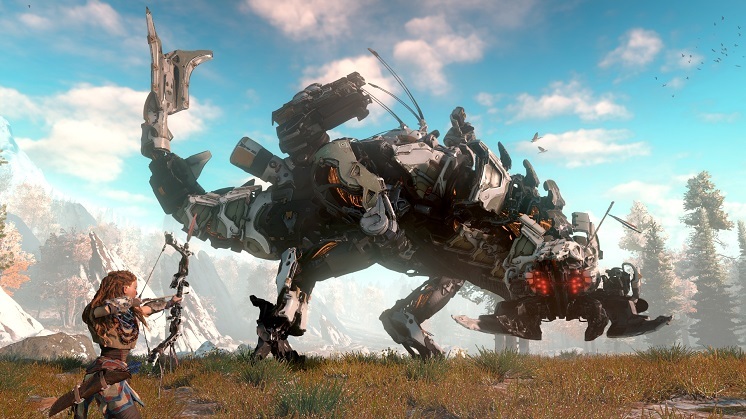 To say that Horizon Zero Dawn is Guerrilla Games’ most anticipated game to-date would be an understatement. Having been in development since 2011 and always being worked on as a next-gen title (this was before PS4 was announced of course), the massive open world adventure featuring a lush, vast post-post apocalyptic world teeming with exploration and danger at every turn is unlike anything the studio has ever put together before. Couple the vision for the game with needing to put a well paced and intriguing story with that world and you have a lot that could go wrong when such ambition is attempted. Thankfully, Guerrilla have risen to the challenge and have not only created the best game they have ever developed but also a game that must go down at the end of the PS4 lifecycle as one of the best first party games to have graced the platform. Horizon Zero Dawn tells the story of our heroine, Aloy, an outcast who is born into a dangerous post-post apocalyptic world – which of course, makes it different to a post-apocalyptic world, okay? 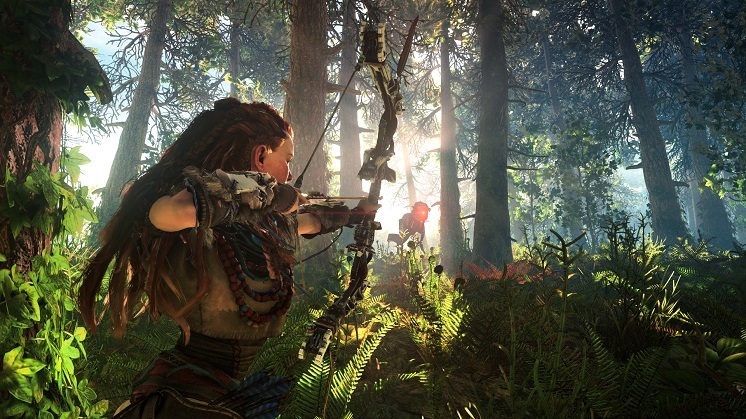 Aloy is raised by a fellow outcast who teaches her how to hunt and use a bow better than William Tell ever could. 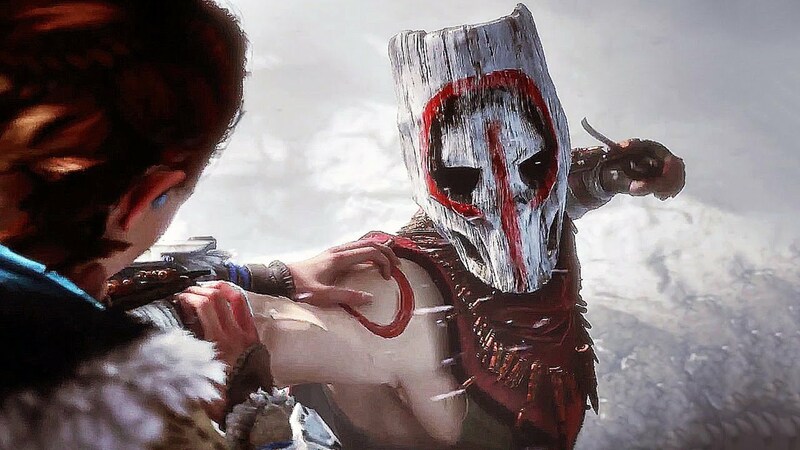 Aloy knows little of her past, and the answers are in her future if she can get through the Proving and become accepted by the tribe, and thus no longer be an outcast. Of course it would be all too simple if it were that straightforward. The Proving doesn’t quite go as planned and thus Aloy’s journey of discovery will take her all through this massive world and involve encounters with other tribes, bandits, some straight up weird folk (no I’m not in the game but thanks for thinking of me), and of course those extremely dangerous mech-dinosaurs that inhabit the world and are more than willing to kill without hesitation because after-all, they are the apex predators. The story manages to remain engaging throughout the 15-20 hours it takes to get through. Aloy is a young woman with an unknown past searching for answers in this dangerous world. 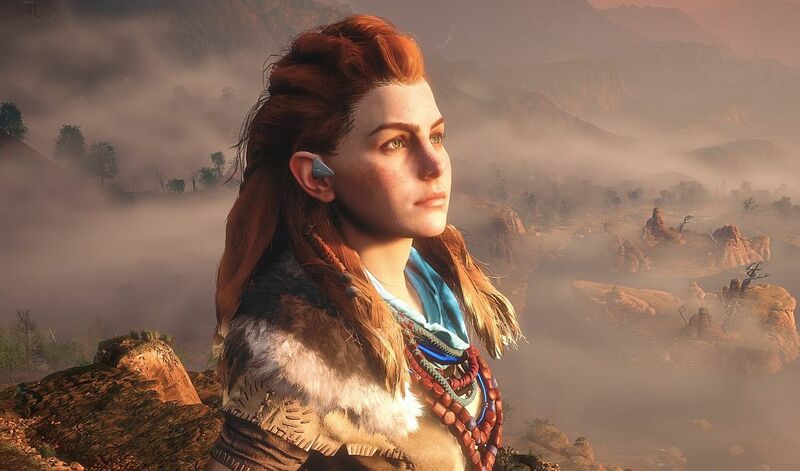 Along the way players have the chance to help forge Aloy’s character, with some choice how you want to respond to certain interactions, and choices being a smart-arse, thoughtful or heartfelt response. Each choice will show off a part of Aloy’s character and allows you to make the personality you want her to have come to the fore. It is a good system but the majority of the interactions don’t come with that choice of crafted response, so depending on your choice it can feel a tad out of place with all other interactions. It’s amazing how quickly you become invested in Aloy and her story. Sometimes these big open world adventure games can drag on and become boring: not so with Horizon Zero Dawn, as Guerrilla have put a lot of love and care into the game and it shines through the story. Part of what creates that investment in Aloy is starting off the tutorial phase of the game with her as a child. It kind of feels like she imprints on you and her story of growing and discovery becomes your story and one you want to see through to the end. Another aspect of this adventure that is worthy of mention is the pacing. Often in open world games the story seems disjointed: you’re tasked with some all-important story to work through where the stakes are high, yet all of a sudden you can run off and go fishing or head on into a shop because making sure you have a super-fly outfit on is absolutely critical. The story is well thought through. 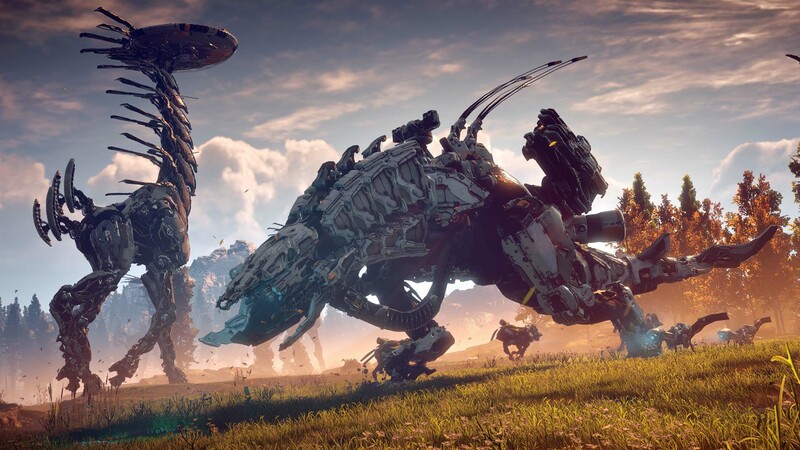 Yes, there is some serious stuff going down in this world and yes, these massive mech-dinosaurs appear to be becoming more dangerous with the help of some tribesman who don’t fully appreciate what they are doing, but the story always feels like it’s about Aloy’s journey. Aloy comes across naturally as a compassionate person looking for answers, and she’ll stop at nothing to find those answers out, yet at the same time it feels right that she would stop and help people along the way because she can relate to their heartache, since it resonates with her own. Right from the outset two things are obvious: this world is absolutely massive and the visual detail and quality is stunning. I thought that Uncharted 4 was the best looking game on PS4, but along comes Horizon Zero Dawn and raises the bar to a whole new level. Guerrilla would have been forgiven if visual quality became a trade off in order to bring this huge open world to life, but there are no such trade-offs. You can see out into the vast distance and admire the scenery and detail, or look at the surroundings closer and watch as the leaves on the trees sway and react to the wind, bringing that invisible force to life and making this world feel that bit more alive. I reviewed Horizon Zero Dawn on the PS4 Pro which has two settings for the visuals, 1080p rendering with more stable frame rates or 2160p with less stable frame rates. Of course I went for 2160p. Why have a PS4 Pro and 4KTV if you don’t make use of the uptick in visuals? It really is something you have to see to believe. Heading into cut scenes you’ll be able to notice individual pores on skin and other fine details. Machines, humans and foliage all convey a natural beauty that fits this world perfectly. The way nature has reclaimed the world and the way that is presented makes this feel like it really is a world that is post-post apocalyptic. When it comes to the gameplay Horizon Zero Dawn is for the most part fantastic, save for one really glaringly obvious issue (I’ll come to that soon). The inventory and resources system coupled with the skill tree progression complements Aloy’s own growth perfectly. You choose what skills you want to prioritise developing and you choose what types of weapons she prefers. Keep in mind though that different machines and different human foes have strengths and weaknesses, so for the most part, a horses for courses approach is well worth considering. This is a game all about exploration and that includes exploring the environment before entering major combat. Aloy has her focus on hand to call up whenever she wants, so make good use of that, survey the land and its inhabitants and plan how you want to attack. Lay your traps where possible and think about points of escape if required. The more carefully you plan the greater chance of surviving you have. The machines themselves are a worthy foe. Each has their own strengths and weaknesses and as you progress you’ll discover some big suckers that require a truck load of weaponry to take down. It’s a fight that is rewarding when you finally see that huge machine collapse on the ground, then steal its resources for your own personal collection and fulfillment. Where the combat system falls over is its human foes. These guys have to be the dumbest bunch of enemies I’ve had the pleasure of playing against. The challenge you get from fighting machines is offset by the stupidity of the human enemy AI. You can literally hide in a bush, lure an enemy toward you while another is alerted, silently kill that guy without his mate seeing then lure him over and watch him humorously ignore his dead mate and walk straight into another stealth kill. I cleared an entire bandit camp by this method and started to see a small pile of bodies build up that continues to be ignored by the AI. Other than the AI, Horizon Zero Dawn plays incredibly well. The inventory system has been well designed to allow players to change weapons and recraft ammo on the fly, which is perfect for some of the more intense battles. You can happily keep going hard and not feel like recrafting is going to cost you the fight. Skills are well balanced and the progression along each skill tree feels natural. The only downside to weapons is that when you trade with Merchants you can’t compare your current weapon capabilities with that of what you want to buy, so unless you exit out of the Merchant Trading menu and go into your own inventory you can’t see whether the trade is good or bad.